One of the ironies about blogging about weight gain, loss and maintenance is that nearly two-thirds of the world’s population is underfed. • Right now, more than 500 million people are living in “absolute poverty” and more than 15 million children die of hunger every year. • World Health Organization estimates that one-third of the population is underfed and another third is starving. I am fortunate to have the means to choose and purchase the food I want. As such, I believe I have a moral obligation to help those who can’t. As part of that effort, I’ve joined BlogCatalog’s Bloggers Unite this day to promote world hunger awareness and to support the organization Heifer International. Heifer International provides communities worldwide, including 27 active programs in cities and rural areas across the United States, with livestock and agricultural training to improve incomes and to stop hunger. A sort of “teach a person to fish…” approach. In a world where land is overused, community members need to learn how to protect and rejuvenate their land, water and other natural resources. Heifer helps by teaching environmentally sound agricultural techniques. Before any Heifer animal is passed along to a project partner, Heifer trains the new recipient in animal management, using our strictly enforced Animal Welfare Guidelines. In Heifer’s view, gender equity is a social justice and human rights issue that directly leads to ending hunger and poverty. That’s why our participants are equal partners in sustainable development projects. Today, we as a world community, confront AIDS, a virus that in the past 25 years has either infected or killed over 64 million people. It is not only a health issue, as it fractures every sector of society, for Heifer, it is a prominent concern in the arena of sustainable development. This is why Heifer is incorporating HIV/AIDS education in our community training groups. Heifer provides both “no-interest living loans” in the form of livestock, as well as small monetary loans to help people start and expand businesses that yield big benefits for families. Heifer is reconnecting city-dwellers with their food sources, building strong alliances and instilling an entrepreneurial spirit among adults and youth through our Urban Agriculture projects. Heifer weaves youth-focused programs through all our project work and emphasizes young people’s needs. These are initiatives I’m glad to support and hope you would consider contributing, too. Not sure what to buy a loved one for their birthday? Consider the gift of cows, llamas, seeds and nutrition to struggling farmers through Heifer’s Gift Catalog. For $10 you can share in the gift of sheep, rabbits, trees, goats or pigs. For $25, share the gift of a water buffalo. $20 will buy a flock of ducks, geese or chicks. I pledge to gift bees in honor of my daughter for Mother’s Day. 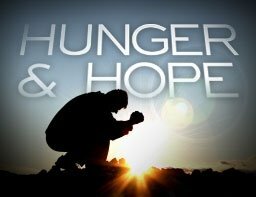 Hunger and lack is prevalent where I live in rural Appalachia, as I’m sure it is where you live as well. Contributions to local food shelves are always welcome (and not just at Thanksgiving and Christmas). I’ll donate one item to our local food shelf for every comment posted on this entry through Friday, May 1. I hope you’ll consider a contribution to your local food shelf or will seek out other means of helping someone struggling with a different kind of food issue, one that many of us who have lost weight or are choosing to lose weight don’t struggle with, that of lack of food and improper nutrition. This entry was posted in Uncategorized on April 29, 2009 by Lynn Haraldson. What a great reminder of the incredibly skewed distribution of the world’s resources. It’s easy to feel like being overweight is unbearably difficult, but I think we often forget that so many face the exact opposite problem and struggle every day just to survive. What a great suggestion to make donations instead of giving meaningless presents. I know personally I would appreciate a donation so much more than another material item. Great eye-opening post today. Sometimes it is easy to forget how blessed we are. Thanks for a great post today, Lynn! I’ve heard of Heifer International, and it sounds like a really good charity. I’m also a strong supporter of giving locally, and I like your idea of per-comment donation. Hey Mom, I was cleaning out the cabinets and found some baby food Claire never liked, you want to donate that, too? This is really a great article, in fact I am a bit fascinated when it comes to gender equity, cos I do believe that it is just that everyone is treated equally and fairly. So my compliments to those people who don’t look of what a person is, color and race. Great post! We must all count our blessings and help those who are lacking. Thanks for the post. Someone gave a lamb for my Christmas gift this past year. It was the best gift I have ever received. I volunteer at a free medical clinic and see first hand patients coming in that are not eating each and every day. Thanks for donating to the local food bank, you are an inspiring woman. Great post! So easy for us to forget how blessed we are with the sheer abudance in our lives while others suffer! I like your idea of a per-comment donation and will be looking for my pantry for items to donate to Harvesters (our local food pantry organization). Sorry — I should not type before coffee! Great post! So easy for us to forget how blessed we are with the sheer abudance in our lives while others suffer! I like your idea of a per-comment donation and will be looking in my pantry for items to donate to Harvesters (our local food pantry organization). Thanks for this wonderful post and reminding us to count as blessings those little everyday things we take for granted, like food and a bed indoors! How about a challenge to all Lynn’s blessed readers: make a donation to your local food pantry, too. Call them before you go shopping and find out what they really need. I’m vowing to give based on the comments made here through tomorrow (like Lynn). I don’t think she’ll mind me stealing her idea. Thanks for the comments! So glad you’re considering donations yourself. Ruthann, what a thoughtful gift at Christmas! You must have loved that. I know my daughter will love the bees. Linda, you’re not stealing my idea 🙂 Lord knows this isn’t an original one on my part. That’s right. i agree with you there. There are those people out there in our world who don’t have enough. The only way that we can reach out to them is by donating something to charity foundations. Good for you, Lynn, for trying to make this world a better place! I just LOVE your blog, Lynn! Thanks for all you do to help empower others! I’m truly shocked that there are only 18 comments so far! Love your blog! Thanks for all you do. Thank you for another eye-opening blog!! Sorry I missed this earlier…thanks for the enlightenment on so many issues.